SPECIAL offer by balcony hostel to our guest. one way phuket - phi phi island 300 baht. one way phuket - phi phi - krabi 700 baht. one way phuket - full moon party 700 baht. phi phi island day trip by speed boat 1100 baht. 5 island seacannoe (james bond island) 1200 baht. you can be arrange with balcony team on arrive. Get ready pack your stuff and enjoy the sunshine lay down your back on a white sand beach and enjoy sun bath Eternal summer. Big fun with top 5 of the word night life street Bangla Road Dance Drink Drunk colorful night life party of Phuket. Our aim is to provide a modem and quirky atmosphere for you to enjoy the backpacking experience with your friend and fellow backpacker's alike. We provide a downstairs area with a bar, pool table, television and some funky music for you to chill out to. If you feel like a bite to eat, then we have a restaurant, which provides a range of both Thai, and international dishes for breakfast. lunch and dinner. Feel like working on you tan? Or going for splash in the water? We are just a few minutes walk away from the beach. For those who like to party, then we definitely recommend you hit up the most famous road in Phuket, Bangla Road-well know for it's vibrant night life. This is definitely an Experience of a lifetime. We are within close distance and you can either catch a Tuk Tuk and arrive within a few minutes or you can opt to walk. For those of you who are shop-o-holics, then Phuket is definitely the place for you! You can take your pick from the wide variety of stalls and markets along the streets. We definitely recommend you to check out Junceylon- a big shopping mall which consists of both international and local retail stores. The local Markets in Phuket Town are also a huge hit with tourists as you can buy just about anything you want ranging from clothes to food. Les us not forget the local cuisine. For all your food lovers, you will never be short of a place to eat! Take a walk down the street and you will find a wide variety of food stalls to eat from, ranging from local street food to the more classy Thai restaurants. As a family owned business, we appreciate the importance of good hospitality. That's why we will do the best to make you trip as enjoyable as possible. We want you to take pleasure in the amazing experiences that Thailand has to offer. We look forward to seeing you soon at Balcony Hostel! If you have any questions then please do not hesitate to contact us. 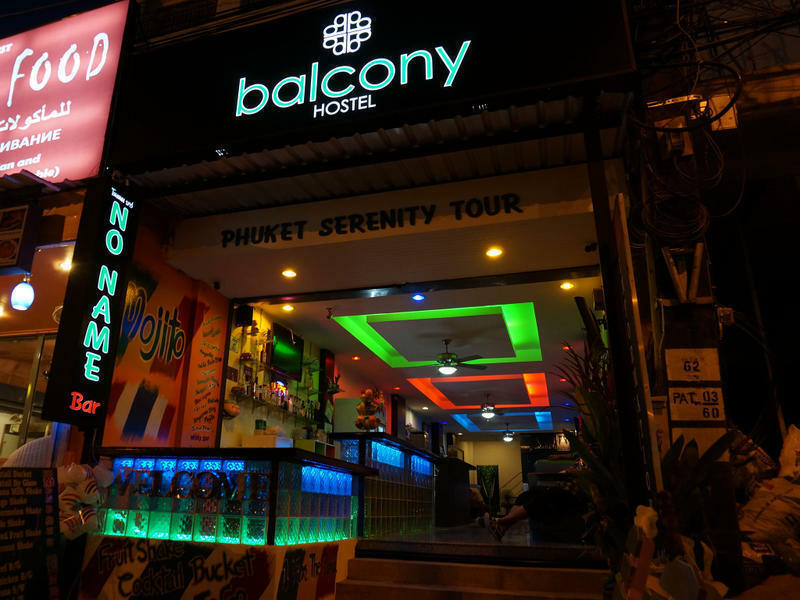 When you arrive to Patong from Kathu, you along to Rat-U-Thit road you should turn left at end of Rat-U-Thit road, than when you reach next intersection you will see our building on right hand at the corner of intersection.